MiniOne XL - Preservatech Inc. The Mini XL constant volume humidity generator is an automatic, positive pressure humidity control device for museum displays. The Mini XL offers a unique scalable output: a single unit in remote location can reliably maintain stable humidity levels in multiple small, or one or more very large showcases, up to 80 meters distant. The Mini XL can provide up to 430 cubic meters of pollution free, clean, humidity controlled air per day. One or more air pumps are used to provide filtered air at the delivery pressure and flow required for the application. In the Mini XL the air is passed through an cooled water bath to control humidity levels, and distributed to the enclosures via flexible tubing. The Maxi XL uses small diameter hose to distribute conditioned air to showcases up to 80 meters away, allowing great freedom for new architectural design and easy retrofitting when renovating. Air is supplied as a positive pressure feed only, there is no return flow. Displaced air from the case is exhausted through naturally occurring leakage, preventing ingress of dust or pollutants. Various diameters of delivery hose can be used, depending on hose runs and applications. Built-in rotameters provide exact control for each air output. The system consists 3 modules: main module, water container and air pump(s). If system is connected to domestic water source it will function fully automatically, needing minimal maintenance. Whole system consists 3 modules: main module, water container and air pump/s. If system is connected to the tap water source its fully automatic and needs very little maintenance. The MiniXL units can be located up to 80 meters from the gallery, in a machine room, janitorial closet, or any space with adequate room, ventilation, water supply (optional), drain (optional), and power connections. The unit should be floor mounted or located on the shelf. The unit will operate in an environmental range of 15 to 30 degrees centigrade and at higher humidities, but optimum performance will be found at lower ambient temperatures. The unit comes complete with a high-quality temperature and humidity sensor which must be located in the gallery. Sensors may be wall mounted, or optionally placed in a “representative” showcase. Environmental data is returned to the control panel on the unit by cable. Existing museum Wi-Fi networks may be used to connect the units to the internet, and rhmonitoring. com is accessible through any web connectable device. Monitoring can be done from any location. rhmonitoring.com can be used to report on current relative humidity and temperature conditions and historical data, as well as changing some operating parameters. Sensor history graphs may be generated, and notifications and alarms can be automatically sent by email as required. Power supply: 110-230 VAC. Typical 15A fused receptacle. 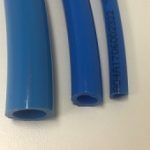 Water supply: optional, ¼” hose connection for domestic line. Drainage: Floor drain or containment tray. Air distribution attachment with multiple outputs and rotameter for each output.